I am into Logistics so today I was reading an article about the peculiarities of Truck owner’s requirement from the manufacturers. No connections though but in a split second it just reminded me of a blog mentioning “How to make your blog popular’. There was a point mentioned that your different blogs need to carry one or two peculiar quality of its own running through all the blog entries. My mind drifted from the articles on Indian Truck senario and I started contemplating on the blog article.I realized , so true, Kavita in kavitasaharia-myroom.com generally writes about the north east, Smita in books-life-n-more.blogspot.com generally writes about books in , Ashok Pandey in kabaadkhaana.blogspot.com generally writes about literature, Shirili in turkishliterature.blogspot.com is generally writing poems about woman, R Ramesh in globalmadarasi.blogspot.com is generally writing humor. While I was pondering on it, I felt that knowing or unknowingly even my blog entries also have strain of INDIA running through. I also give out things which I find strange and then from somewhere or the other INDIA just sneaks into that topic. India Rocks rocking me from soul! “It is 4 a.m. on a cool February morning. Hundreds of trucks are heading into Chennai’s Koyembedu vegetable and fruit market-one of the biggest markets in Asia-to unload their cargo like they do every day. What was unusual that day was the presence of three German executives from Daimler AG who were busy interacting with the drivers using their Indian colleagues as interpreters. They had come to understand drivers’ perception of safety-what they thought about collapsible steering, air bags or honeycomb paneling for the front of the truck which will collapse on frontal impact and thus save the driver. What they learnt stunned them. 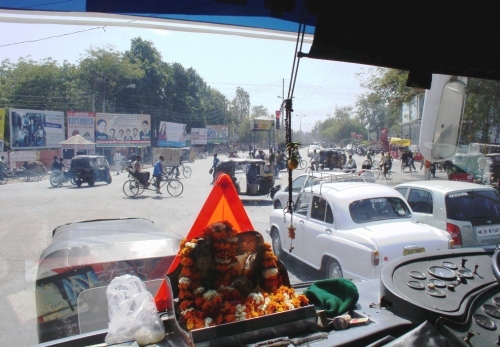 Indian truck drivers have little interest in these safety features and prefer to leave their safety to the lemon and green chilly they string and hang in front of the truck and an idol of their favorite deity they place in the dashboard. Once back home, the Germans tweaked the dashboard design for all the Daimler vehicles that will be manufactured and sold in India to include a flat surface to mount God’s idol, apart from incorporating the various safety features. I know you are smiling too after reading this:) As they say, It happens only in India! i am a great fan of this blog and the blogger. thanks Kavita for introducing me to a lovely blog of http://maradhimanni.blogspot.com. Read it, Loved it! What you said is right, Jyothi! Many people here write about some subject a lot…maybe the subjects touch their hearts and write about them often! Yes, Kavita introduces us to the NE area, their lifestyle, food habits etc. which were never written much before her. They are new to most of us. Now I am smiling broadly, Jyothi! Forwarded this to my son too who always laughs at our ‘bhakti’…he is going to laugh more now! Thank you! I am going to enjoy reading your posts, now! @ Sh@s and Zeba: Your first comment on my blog,thanks! welcome aboard! Thanks@ Md Israr! every country has its peculiarities. I am at Amritsar, so we receive a lot of Pakistani trucks too at Wagah-Attari border. They are so unique in them selves, so much decorated.I don’t have its pics, but very fascinating paintings and decorations on them! Ha ha.So true.I guess all countries and societies must have their peculiar needs and habits. What the executives from Daimler learnt is basically of common sense. Somehow a lot of manufacturers don’t bother to find out what the buyer really wants.Not so long ago men designed kitchens without bothering about the height and requirements of the women who were to use them. The momentum for Macklemore & Ryan Lewis’ ‘Thrift Shop’ continues to rise, as the band sits atop the Ultimate Song Chart for a third straight week. Martin Solveig & Dragonette-“Hello” (Dada Life remix). In the end, students would have acquired the skills and knowledge to improvise on the spot. Wonderful write up !!! Recognizing the subtleties of customer requirements and incorporating them in the product design gives that extra edge to the product which is essential for it to capture the required market share !!! In this fiercely competitive world, this human centric design effort is absolutely essential !!! So Daimler executives definitely stole a march over others by Interactive learning from Indian drivers and incorporating their peculiar preferences in their design . Great work Jyoti to spot this incident as a logistician and place it in the Blog !! !